Silence in the Library Publishing has put out a brand new anthology and is a collection of superhero stories. It's a fantastic collection and I'm very proud of it. 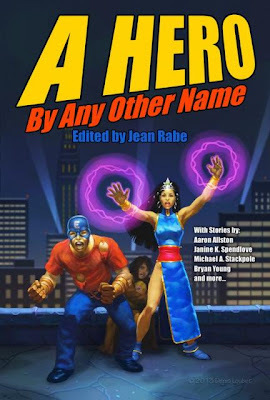 First off, it has stories from Michael Stackpole and Aaron Allston in it. And a story by me. My story, called "Changing The Game," is about the sidekick half of the Kid Sleuth and the Inspector team. It is now on sale through Amazon, but you can buy it here directly, $15 + shipping, at a much better benefit to the authors. In fact, this is another instance of Silence in the Library publishing (the first being Time Traveled Tales) where the proceeds are split equally among the others and not funneled through all the overhead of a publishing company. If you buy it from us, more money is going into the pockets of the authors and artists behind this book in an equitable way that would be unheard of for traditional publishing.